Each block of this quilt is essentially its own miniature quilt. 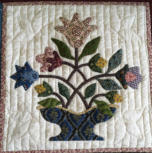 More than 80 GVQC members constructed a 10-inch block of cotton fabrics, and quilted it on silk batting. Each of these blocks was then individually bound, and securely stitched together around a 20-inch center block made by club member Christine Wickert. 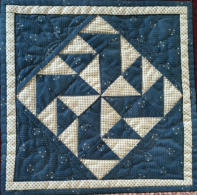 The blocks feature piecing, appliqué, and embroidery as well as hand or machine quilting. Many different large scale chintz-like fabrics on the back make the reverse of this quilt as rich and exciting as the front. The border is a “penny rug,” incorporating many of 19th century reproduction fabrics used in the blocks. Raffle tickets will be available for $1.00 each starting December 1, 2018 and available at the show. 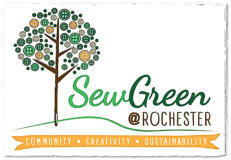 All proceeds from the sale of the raffle tickets will benefit two not-for-profit charities: Sew Green@Rochester (sewgreenrochester.org) and ExPERIENCE FIBERArt, Inc. ( experiencefiberart.com ). Raffle drawing will be held on Sunday, June 2, 2019 at RIT’s Gordon Field House. You need not be present to win. 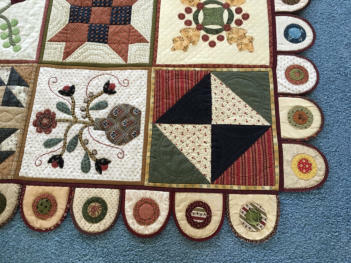 Please help support fiber arts in the greater Rochester community by purchasing tickets from GVQC members and at the Genesee Valley QuiltFest quilt show. Each block of this quilt is essentially its own miniature quilt. More than 80 GVQC members constructed a 10-inch block of cotton fabrics, and quilted it on silk batting. Each of these blocks was then individually bound, and securely stitched together around a 20-inch center block made by club member Christine Wickert. 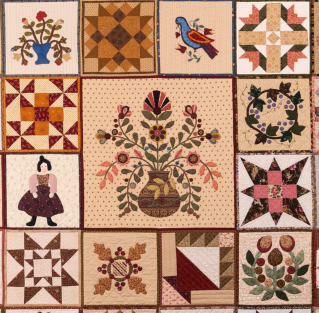 The blocks feature piecing, appliqué, and embroidery as well as hand or machine quilting. Many different large scale chintz-like fabrics on the back make the reverse of this quilt as rich and exciting as the front. The border is a “penny rug,” incorporating many of 19th century reproduction fabrics used in the blocks. Raffle tickets will be available for $1.00 each starting December 1, 2018 and available at the show. All proceeds from the sale of the raffle tickets will benefit two not-for-profit charities: Sew Green@Rochester (sewgreenrochester.org) and ExPERIENCE FIBERArt, Inc. (experiencefiberart.com). Raffle drawing will be held on Sunday, June 2, 2019 at RIT’s Gordon Field House. You need not be present to win. 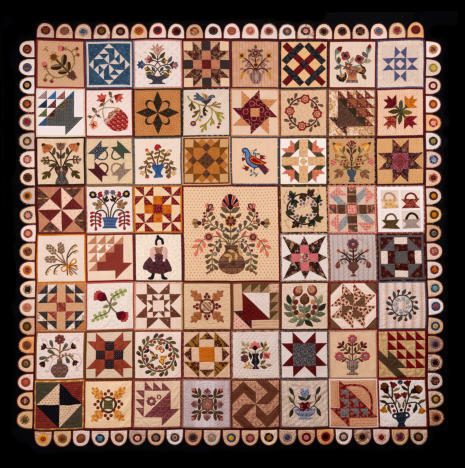 Please help support fiber arts in the greater Rochester community by purchasing tickets from GVQC members and at the Genesee Valley QuiltFest quilt show.